Lock in a great price for Eurostars Mediterranea Plaza – rated 8.4 by recent guests! Super location with views to Castillo de la Santa Barbara. Very good breakfast. Professional, helpful and nice staff. The room was very clean as well as the bathroom. Because the bed was very comfortable and there was no noise from outside, you could sleep well. The breakfast was excellent with a wide selection of different kind of food. The hotel was in the heart of the city and therefore you could walk, where ever you wanted to go. There were many shops, cafe´s and restaurants near the hotel. The beach, the taxi station, and the "Paseo Maritimo" ( the seaside promenade) where next to the hotel. I have been overnight in many Spanish hotels and this was one of the best. 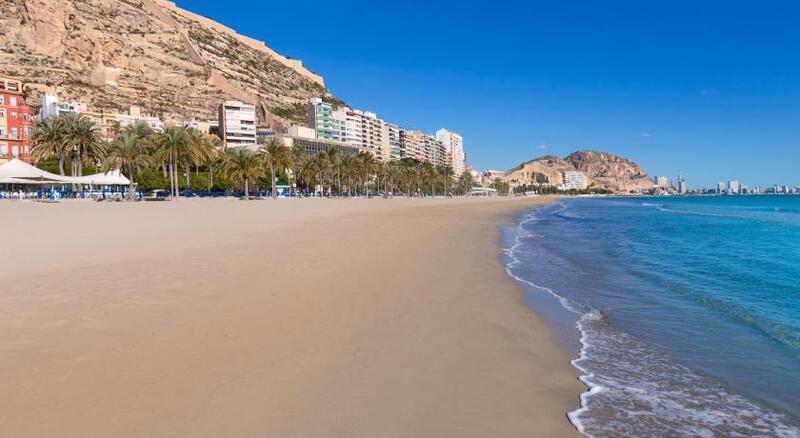 Sensational location in the nicest part of town just opposite the beautiful Town Hall, with everything including Alicante's lovely beach just a couple of minutes walk. Very friendly and helpful staff. Great little cafe in the plaza. I chose this hotel for its location... right in the heart of the city and close to everything. The room was nice but the bed and the pillos were a bit to hard for my comfort. The Wifi was good too, Breakfast was good too, area restaurants and shopping is very close. There was a good choice of food for breakfast. The service was also good. We loved our large 5th floor room with a view of the plaza and castle with great sound proof windows. Eurostars Mediterranea Plaza This rating is a reflection of how the property compares to the industry standard when it comes to price, facilities and services available. It's based on a self-evaluation by the property. Use this rating to help choose your stay! One of our top picks in Alicante.Eurostars Mediterranea Plaza is 350 feet from Alicante’s Postiguet Beach, and has a roof terrace with city views. It offers a free sauna and gym, and free Wi-Fi. The elegant Mediterranea Plaza offers modern, air-conditioned rooms. They all have satellite TV and a mini-bar. The hotel serves a daily buffet breakfast. 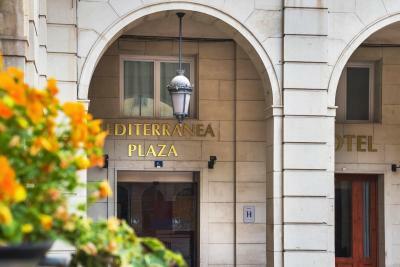 Hotel Eurostars Mediterranea Plaza is set in the historic city center, next to Alicante Town Hall. Saint Nicholas Cathedral and Santa Barbara Castle are a short walk away. Alicante Airport is just 5.6 mi from the hotel. When would you like to stay at Eurostars Mediterranea Plaza? This modern, air-conditioned room has free Wi-Fi, satellite TV and a minibar. This modern, air-conditioned room has free Wi-Fi, satellite TV and a minibar. 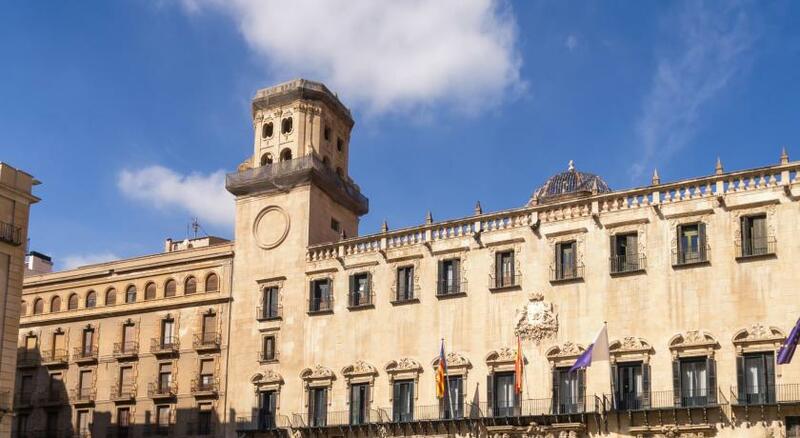 It overlooks Alicante Town Hall Square. This modern, air-conditioned room has free Wi-Fi, satellite TV and a minibar. 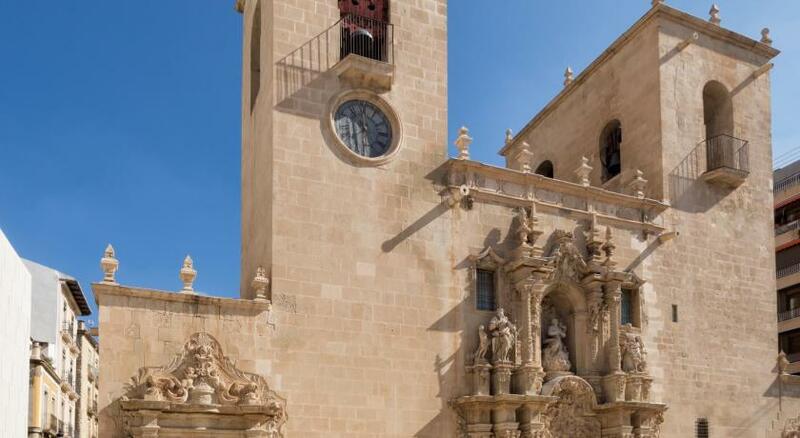 It overlooks Alicante Town Hall Square and Santa Barbara Castle. This modern, air-conditioned room has a king bed, a terrace, free Wi-Fi, satellite TV and a minibar. 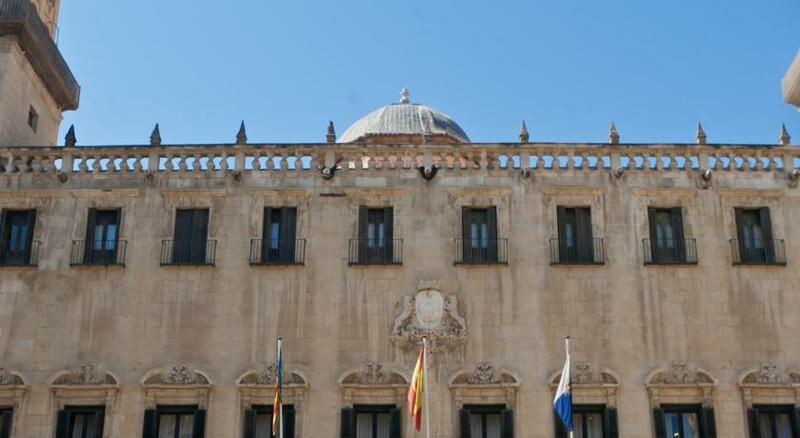 It overlooks Alicante Town Hall Square and Santa Barbara Castle. House Rules Eurostars Mediterranea Plaza takes special requests – add in the next step! Eurostars Mediterranea Plaza accepts these cards and reserves the right to temporarily hold an amount prior to arrival. Guests arriving by car should note that there is space to load and unload luggage in the Town Hall Square. Reception can then advise on the nearest car parking facilities. I had asked for a quiet room. It was not as it was right above the entrance of the hotel. Parts of the interior of the hotel look a bit tired and in need of renovation. Convenient location and close to the beach. Friendly and polite staff. Nice breakfast. Was initially worried by the church bells but they stopped at 10pm and didn’t start again until 9am so all was well. Wonderful location, close to everything that’s great about Alicante: the port, cathedral, castle, old quarter, promenade and fabulous bars and restaurants. We had a great room, very spacious with a lovely view over the square and castle behind. The location of this hotel is very good with plenty of local bars and restaurants nearby. There is quite a lot of noise due its location but we thought it was a fair trade-off. Nothing else really! This hotel is in a very central location. You can see the castle from many of the windows. The staff were nice and helpful. The room was large and clean. Poor lighting in room, reception old and worn looking..... Defiantly not a 4 star. Shower head insecure, sprays all over room when on full power. Little choice at breakfast. Breakfast room dull and in need of brightening up. We booked this hotel because we recently stayed in a Eurostars hotel Budapest Center and it was so nice and we expected the same in this hotel. Very comfortable beds and perfect location. When we booked facilities stated room controlled air conditioning. But it didn't mention this was only in the summer months. View from our room was the building about 10 meters away. Continental breakfast okay, but scrambled egg and bacon were cold which ruined it. Comfortable bed, brilliant shower, good hairdryer, TV had a couple of English speaking news channels. Good location - easy walking distance to main tourist attractions and beach/marina. said we would be arriving at around lunch time regarding an early check in but room wasen't ready until 4 pm. room was really clean but could have done with a lick of paint. really friendly helpful staff and hotel situated in an excellent location. The staff were friendly and helpful. It was a little difficult to find at first and they gave me clear directions. Very good location. The hotel is located in old tow. The beach is close. a lot of noise from outside in the street. would have been nice to have more English channels on tv to catch up on news etc.